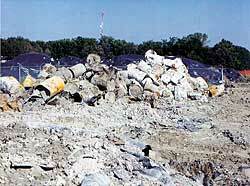 In June 1998, the Indianapolis office of ATC Associates was approached by the director of a county development corporation, based in a mid-sized Illinois city, to help estimate the cost to clean up a hazardous waste site in the city. After careful deliberation and evaluation for the potential for success, these consultants decided to pursue this unique and extremely challenging opportunity. Going forward, they knew that in order to successfully complete this project, they would need the dedication, cooperation and hard work of a broad range of specialists. City officials, state regulators, the bankrupt former owners of the site, the bankruptcy trustees, the board of the firm that had acquired the site, insurance agents, lawyers, environmental engineers, geologists, technicians and many others engaged in an elaborate dance, choreographed to meet numerous environmental, regulatory and financial requirements. The outcome of this complicated and often uncertain process was a successful project in which all the participants take pride. During an initial meeting with the city officials, it was discovered that the former owner of the subject property had agreed with a new purchaser of the facility to escrow $10 million to cover the estimated costs for site remediation. This escrowed money was placed into the hands of the bankruptcy court trustees when the former owner filed for protection. The former owner's creditors were anxious to be paid, but the new owner wanted to ensure that the money would be used to remediate the site. The bankruptcy court held the real estate (land and buildings) as part of the bankrupt estate. Although the bankruptcy trustees had no intention of keeping the land, they realized the difficulties involved with divesting. Interested parties needed resources and experienced individuals to pull together for a common goal. The typical brownfields process usually involves one firm working with other participants to arrange financing, insurance and the implementation of the remediation of the brownfield site. The typical brownfields process is complicated and usually involves one firm working with other participants to arrange financing, insurance and the implementation of the remediation of the brownfield site. As demand for development space grows, particularly in urban or previously industrialized areas, there is growing pressure to generate innovative solutions that permit the re-use of blighted or contaminated sites. According to the U.S. Environmental Protection Agency (EPA), brownfields are abandoned, idled or under-used industrial or commercial properties where expansion or redevelopment is complicated by real or perceived environmental contamination. Specialists in brownfields remediation, including Robert V. Colangelo of the National Brownfield Association, estimate that there could be as many as 600,000 environmentally impaired properties in the United States. Some projections suggest that more than $2 trillion worth of property is undervalued because of the presence of hazardous materials. Community leaders want to clean up blighted urban areas, city leaders are anxious to return abandoned sites to the tax rolls and developers recognize the opportunity for profit in making more productive use of sites that are often well-located and suited for a broad range of commercial applications. Several factors have contributed to the expansion of the nascent brownfields market: growing public awareness of the problem, the gradual relaxation of laws that inhibit the transfer of contaminated property or hold the innocent purchaser responsible for cleanup costs and increased levels of federal and state funding. The realization that contaminated sites cannot be left to stagnate, but must be addressed and remediated, has led new players to more carefully assess their means of managing "smart growth" in this rapidly developing industry. Having determined that the Illinois project had the support of city officials and cooperative former and current owners, all with a real stake in making the remediation project work, ATC committed itself to developing strategies that would lead to an effective and cost-efficient solution. The initial course of action was to evaluate the limited data provided by the city and the trustees, to develop a preliminary remediation plan to excavate and dispose of an estimated 3,000 buried drums containing paint-related wastes and to address impacted soil and groundwater in the drum burial area. The estimated cost for these services was approximately $5 million. The new owner's also agreed to provide a performance bonus if the consulting firm could maintain the budget within specified limits. During meetings with city officials, and as more site-specific information became available, it became evident that the preliminary remediation plan would require revision. For example, the consulting firm learned of a second waste disposal area, a closed wastewater treatment lagoon, potentially contaminated earthen storm drains and 14 additional areas of concern within the footprint of the building on this site. With this new information, the consultants prepared a revised remediation work plan, which originally estimated remediation costs of $11 million. ATC was asked to present this revised plan to the trustees. The trustees gave the consultants permission to obtain additional data in order to fine-tune the assumptions in the revised work plan, and then awarded the consultants a contract to implement the revised, more restrictive work plan. During this time, the consulting firm was negotiating with insurance companies to provide remediation cost cap insurance for the overall project. A major insurance company concurred that this project stood up to its underwriting requirements and agreed to work with the consulting firm and with the city to insure the project. The remediation cost was revised from $11 million to a price of $7.1 million with proposed insurance coverage and was presented to the trustees and to the city. Despite getting the insurance in place and the price right, the deal was not final. The trustees were still looking for a mechanism to give approximately $5 million of the escrow to the former owner's creditors. With the accrued investment interest and lease payments from the new owner, the total escrow account had grown to approximately $12 million. The trustees looked at the cost for remediation, the cost for insurance, the management fees and the desired $5 million for the creditors and concluded that the only way that this deal could be finalized was if an additional $1.6 million could be added into the escrow account. At the request of the trustees, the city purchased the property using a combination of city money and funds provided by the new owner. In return, the new owner agreed to a five-year lease of the facility. As the building purchase deal progressed, so did the contract for the consulting firm to implement the $7.1 million remediation project. The new owner insisted on actively managing the distribution of the funds associated with completing the remediation, adding many restrictions, penalties and performance clauses. The new owners also agreed to provide a performance bonus if the consulting firm could maintain the budget within specified limits. The deal was finally complete 22 months after we started developing the opportunity, in April 2000. One of the unique aspects of this project was an innovative management of finances. This involved performance based payments based upon subcontractor discounting and expedited payment terms. Based on the financial arrangement, the vendors and subcontractors were eager to provide their best people for the project, knowing that the payment terms were better than most projects they were working on. The ATC site superintendent responsible for management of field activities was an experienced senior project geologist based in the Indianapolis office, temporarily relocated to the Illinois city to manage the removal of the drums. The consulting firm subcontracted a geophysical firm to complete a series of electromagnetic scans of the project site. A combination of EM-61, EM-34 (terrain conductivity) and 2-D resistivity systems were employed to assess the drum area and to develop a 3-D map of the inferred drum locations. The drum removal subcontractors then mobilized to the site and utilized the maps provided by the geophysics team to remove the drums. The initial cost estimate was to remove 3,000 drums, plus or minus six percent (by quantity). Actual site conditions resulted in the removal of 5,603 drums. Most of the buried drums were crushed, punctured, leaking and generally in poor condition. Site activities included removing each drum, overpacking the drum if necessary (or evacuation of contents if the drums were too damaged), staging each drum, individual drum sampling, field haz-cat analysis, bulking the contents into waste groups and management of the empty drums (either shredding the drum or sending the drums with solids off-site for disposal). One of the unique aspects of this project involved performance based payments based upon subcontractor discounting and expedited payment terms. As part of the drum excavation program, ATC developed a site-wide sampling and analysis program. The consulting firm named a second senior project geologist to lead the development of the sampling and analysis plan (SAP) who stayed in communication with the Illinois Environmental Protection Agency's (IEPA) project manager and obtained his support and concurrence with each of the assumptions and conditions used as the basis for the SAP. Once the SAP was completed, the senior project geologist managed the sampling teams assigned to collect the data and worked together to get the bulk of the analytical data summarized into tables with preliminary text describing the sampling activities. The consulting firm appointed a third senior project geologist to complete the management and compilation of the data, figures and text for the Site Investigation Report - Comprehensive Site Investigation. The report was prepared in accordance with the IEPA Guidance document for sites participating in the voluntary site remediation program (SRP). Remediation in Illinois is regulated through the SRP under guidance called the Tiered Approach to Corrective Action Objectives (TACO). ATC utilized an Illinois professional engineer to assist the team with completing the technical evaluation of site-specific data using the guidance and equations available in TACO (Phase III). This team completed the task in early July 2001. To date, ATC has completed nearly 80 percent of the clean-up project at the Illinois waste site. Remaining tasks include a limited amount of soil remediation and possibly groundwater remediation. The consulting firm has proposed in situ chemical oxidation be used to treat both the impacted soil and groundwater. Also under consideration is the possible use of small batch volume, on-site thermal desorption as a possible remediation tool. These decisions will be made at the time the final remediation work plan is prepared for the site. The final phase of the project is closure documentation. The project team anticipates completion before December 2001. The new owner currently is using the site for product storage and distribution. This facility services the local regional distribution center of one of the country's largest retailers. The city has begun development of the adjoining property as part of its expansion plan for a local business park. This Illinois project is on course for successful completion, and a site once mired in the legal and financial limbo characteristic of many brownfields properties has already returned to productive and profitable use. The convoluted negotiation process and complicated project management approaches that succeeded in bringing this brownfield project to a positive resolution probably can be replicated, in varying degrees, on similar projects in other states. For additional information on brownfields and links to brownfield-related resources and agencies, visit EPA's brownfields Web site at www.epa.gov/brownfields and the National Brownfield Association Web site at www.brownfieldassociation.org. TACO is Fast, Cheap ... and Flexible. TACO is Illinois EPA's system for developing risk-based and site-specific remediation objectives, replacing a "one size fits all" approach. It provides flexibility to site owners and operators in managing remediation sites, subject to Illinois EPA review and approval. This approach reduces remediation costs, turns around more sites and speeds up the redevelopment process, while complying with environmental laws and regulations. This article originally appeared in the October 2001 issue of Environmental Protection, Vol. 12, No. 10, p. 38. This article originally appeared in the 10/01/2001 issue of Environmental Protection.